CQ is now available in a digital edition as well as the traditional print edition. Find out more details about CQ. NOTE: Beginning with this issue, the CQ Plus digital supplement has been discontinued. Several of its columns are being worked into the regular column rotation for CQ. Both the print and digital editions will continue to be published. The content of both will now be identical. Tell me more details. 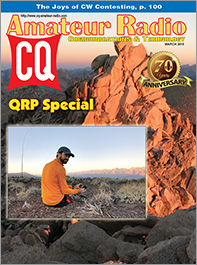 The March issue of CQ is this year's QRP Special, with a special focus not only on operating with low power, but getting out of your shack to get on the air as well. KJ6HOT starts us off with an introduction to SOTA, the Summits On The Air program. Down at sea level, AH6CY writes about operating from a cruise ship in "Have 3 Watts, Will Travel." For those times when true QRP just won't cut it, K4YFR and AJ4YN offer us plans to build the "Rockmitey," a platform to make the classic 1/2-watt Rockmite transceiver better able to hit the trail with you and to put out a little bit more power as well. K1EHZ shows us how to build a portable 7-band end-fed half-wave (EFHW) antenna for QRP expeditions, and we wrap up our QRP coverage with results of the 2014 CQ World Wide Foxhunting Weekend (the hidden transmitter puts out very little power and the hunters only listen). 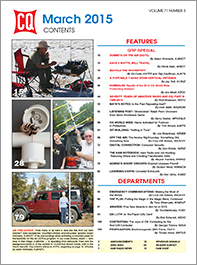 Finally among this month's features, we conclude our 70th Anniversary look at the history of ham radio and CQ magazine from 1945 to the present, with this installment covering 1980-2015. Among our columns, "Math's Notes" editor Irwin Math, WA2NDM, asks whether the past is repeating itself; "Listening Post" editor Gerry Dexter highlights the "Sherlockian" radio sleuthing abilities of contributor Ralph Perry, and our new Emergency Communications Editor, Cory GB Sickles, WA3UVV, writes about funding available from served agencies and about "Making the Most of the Money." 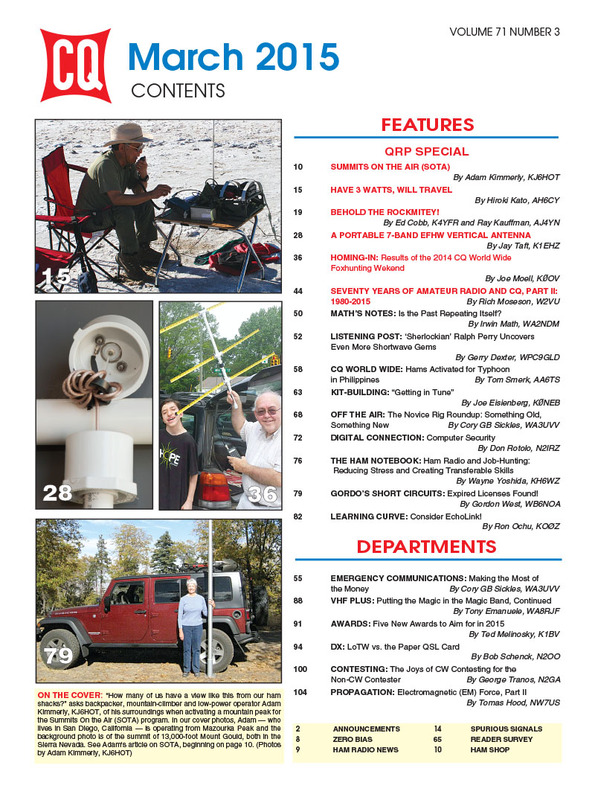 Additional highlights of the March issue include K0NEB's focus on using the proper tools for tuning up your kits; Digital Editor N2IRZ writes about computer security, "Ham Notebook" editor KH6WZ shows you how to leverage your ham radio skills in job-hunting, and "Off the Air" editor WA3UVV checks out the Novice Rig Roundup. That's a brief look at what's coming up in the March issue of CQ magazine. Find more information on becoming a CQ subscriber - print or digital! Zero Bias - "Less is More "